Y is an abstract strategy board game, first described by Claude Shannon in the early 1950s. The game was independently invented in 1953 by Craige Schensted (now Ea Ea) and Charles Titus. It is a member of the connection game family inhabited by Hex, Havannah, TwixT, and others; it is also an early member in a long line of games Ea Ea has developed, each game more complex but also more generalized. Schensted and Titus argue that Y is a superior game to Hex because Hex can be seen as a subset of Y. 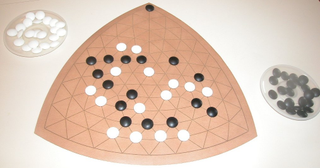 Consider a board subdivided by a line of white and black pieces into three sections. 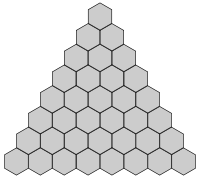 The portion of the board at the bottom-right can then be considered a 5x5 Hex board, and played identically. However, this sort of artificial construction on a Y board is extremely uncommon, and the games have different enough tactics (outside of constructed situations) to be considered separate, though related. In Y the strategy-stealing argument can be applied. It proves that the second player has no winning strategy. The argument is that if the second player had a winning strategy, then the first player could choose a random first move and then pretend that she is the second player and apply the strategy. An important point is that an extra pawn is never a disadvantage in Y. Y is a complete and perfect information game in which no draw can be conceived, so there is a winning strategy for one player. The second player has no winning strategy so the first player has one. It is nevertheless possible for the first player to lose by making a sufficiently bad move, since although that stone has value, it may have significantly less value than the second move - an important consideration for understanding the nature of the pie rule. In practice, assuming the pie rule is in force and the official Schensted/Titus board is being used, Y is very well balanced game giving essentially equal chances for any two players of equal strength. The balance is achieved because the first player will intentionally make a move that is sufficiently "bad" that it is not clear to the second player whether it is a winning move or a losing move. It is up to the judgement of the second player to make this difficult determination and invoke the pie rule accordingly.